A T-50 fighter jet during the Russian stage of the Aviadarts 2016 international flight skills competition at Chauda testing center of the Russian Air Force outside Feodosia. The first ground-based ignition for the second stage of the engine for the Prospective Airborne Complex of Frontline Aviation (PAK FA T-50 aircraft) has been successfully conducted by United Engine Corporation (UEC), a part of Rostec state holding company. The United Engine Corporation (UEC) has successfully conducted the first ground-based ignition of the second stage of the engine for the Prospective Airborne Complex of Frontline Aviation (PAK FA T-50 aircraft). The UEC is part of the Rostec state holding company. Gas generators had to be prepared for the testing, along with the demonstrator engine. What is the PAK FA flying with now? The PAK FA is currently using a first stage engine, a modernized Al-41. Pavel Bulat, avionics specialist and head of the Kupol Group of Companies, said the AI-41 is an updated version of the engines used for the Su-27, Su-30 and other models in that series. “The engine for the T-50 was significantly upgraded from the original models, incorporating the latest control system, compressors, and so on. Nevertheless, it still falls short of the 5th generation model, and is very noticeable on radar screens,” said the expert. The new second-stage engine is one of the most advanced in the world, said Bulat. It enables the T-50 to accelerate to supersonic speed, and maintain that velocity throughout the flight, without using afterburners. “The speed will be as much as Mach 1.6 (about 1,200 mph), depending on the terrain over which the flight is taking place. The engine will also significantly improve the stealth properties of the PAK FA, thanks to the use of new composite materials,” said Bulat. The designers expect to start testing the new engine on fighter jets in 2018, and for the motor to be fully integrated in 2020. “In addition to the engine, the radar station also needs to be modified, and engineers need to remove the last deficiencies in the airframe concept, which, among all the aircraft flying today, is the most modern in the world,” said the analyst. The firing unit comprises of the 9-A1-4071K, one of the lightest cannon in its class, which is designed to destroy armoured vehicles or armoured enemy targets. During one flight, the pilot can shoot 150 rounds from the 30-mm cannon.The new weapon is a modified single-barrel GSh-301 aircraft cannon, used in Russian fighters and bombers. The future T-50 5th generation fighter will also carry high-explosive and volume-detonating bombs, Sergey Rusakov, General Director of the Techmash Group, stated on September 22. Rusakov said they were considering high-explosive incendiary OFZAB-500 aviation bombs for the PAK FA, and volume-detonating ODAB-500PMV, currently being used in Russian operations in Syria. Engineers have already produced a set of warheads for future tests. According to the rearmament programme, Russian Armed Forces will receive a batch of 12 T-50 fighters before the end of this year. A new contract for the supply of 5th generation aircraft will be discussed with the Ministry of Defence at the end of 2016, after which the War Department will decide how many new aircraft are needed. 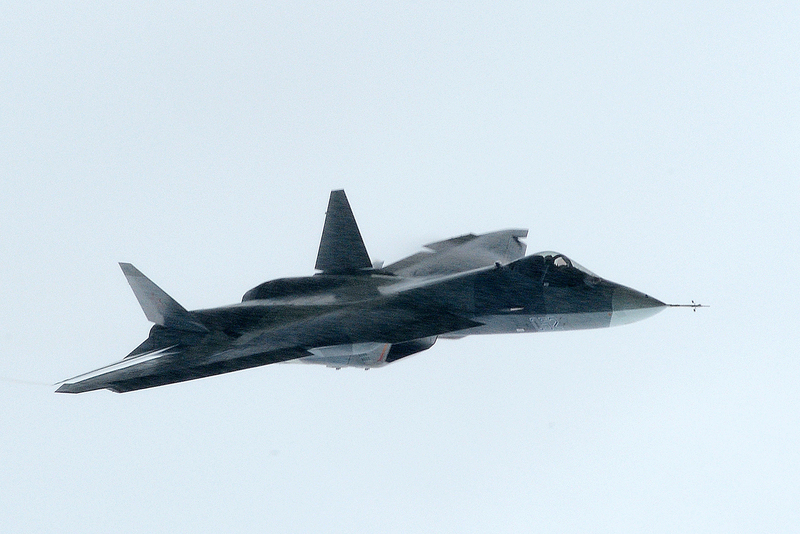 The newest Russian fighter aircraft was built as the main competitor to the F-22 Raptor. The American stealth fighter distinguished itself during the Iraq War. “The T-50 will go into serial production much later than the Raptor. This allows us to take into consideration all the pros and cons of the existing aircraft when constructing our own fighter. A similar situation existed when we were working on the multi-purpose 4th generation Su-27 fighter. The prototype of that domestic aircraft came out much later than the American F-16, and took into account the shortcomings of its precursor. As a result, the domestic Sukhoi was able to beat the ‘American,’ in terms of combat characteristics,” Vadim Kozyulin, Professor at the Academy of Military Sciences, told RIR. The expert noted that the T-50 would be able to use the full range of existing high-precision air-to-air missiles, as well as all precision-guided munitions. “As part of the ‘stealth’ concept, special missiles for the PAK FA are being developed, with a square cross section that will allow more warheads to be carried in hatches during combat missions,” Kozyulin added.